Wow. Courageous, honest and unscripted. Relief at last. I had stumbled upon Emma Creighton’s log entry from Oct. 27, while she was on the second leg of last year’s Mini Transat race from Funchal on the island of Madeira to Salvador de Bahia, Brazil. 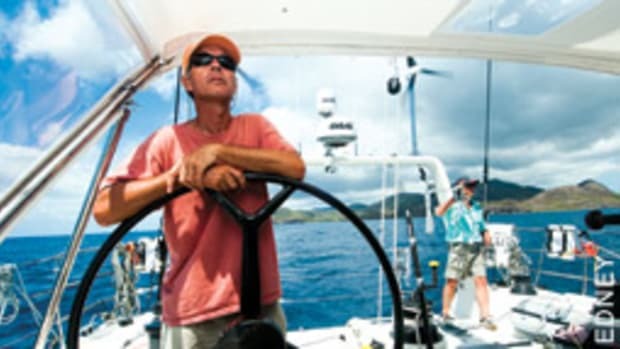 It’s a biennial event for single-handers who sail 4,200 nautical miles across the Atlantic from France to South America on tiny tricked-out boats. 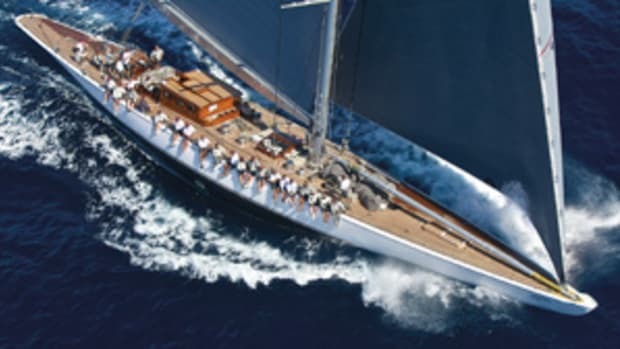 Classe Minis, as they are called, are 6.5 meters, or around 21 feet, and have canting ballast and as much as 1,200 square feet of sail. To do this race with these boats you have to be nuts. 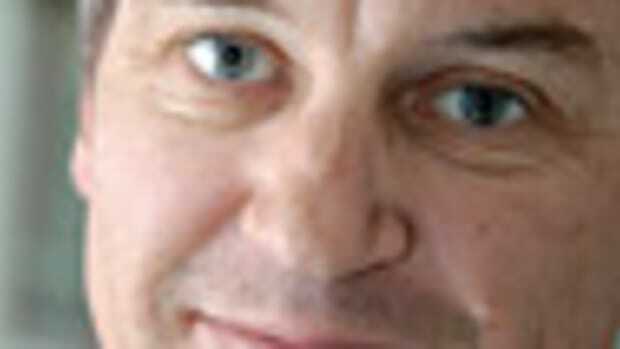 And you have to have cojones. Last year, Creighton, 27, was one of six women among the 79 starters (www.emmacreighton.net). After Gale Browning in 2001 and Amy Boyer in 1979, she became the third U.S. woman to finish this race. But Creighton wasn’t into just finishing. After a combined time of 30 days and 51 minutes for both legs, she was the fastest woman and took 19th place in the prototype class. 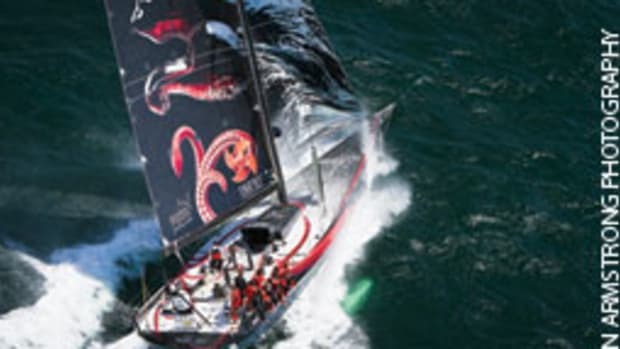 She covered her spread and perhaps could follow the likes of Isabelle Autissier, Dame Ellen MacArthur, Catherine Chabaud and Samantha Davies, who parlayed good finishes in the Mini Transat into stellar ocean racing careers. But in St. Barts, at the finish of the French Transat AG2R La Mondiale double-handed race, something clicked. She took in the scene, she talked to sailors, and she vowed to become one of them. She moved to San Francisco, hoping to get opportunities to hone her skills. “But if anything, it was even harder than on the East Coast,” she says. It dawned on her that she’d have to do this on her own. 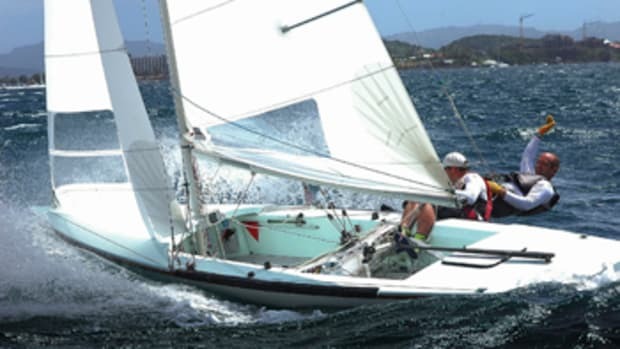 The Mini 6.50 is the entry drug for single-handed ocean racing because it’s small, fairly affordable, and used boats can still be competitive. 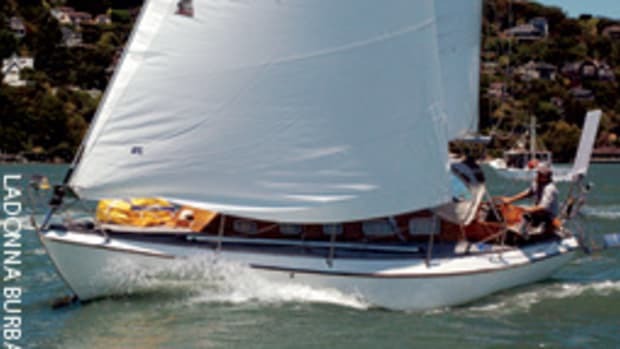 She picked one up in France and shipped it to San Francisco, where she worked as a sailing coach. She crewed at the 2010 Melges 32 Worlds on the third-place boat and raced her Mini, Pocket Rocket, to Hawaii in the Pacific Cup, taking third in the double-handed class with a guy she’d never sailed with before. Great, but as a newcomer without a title sponsor, how could she afford it all? “I had help from family,” she says. Her father, Bill Creighton, who took little Emma sailing on his 30-foot Morris Leigh double-ender and later on an O’Day daysailer, lent a hand. But it was different now that she needed to make the decisions. “He was a great support, helping to deal with banking and finding items that I needed,” she notes. 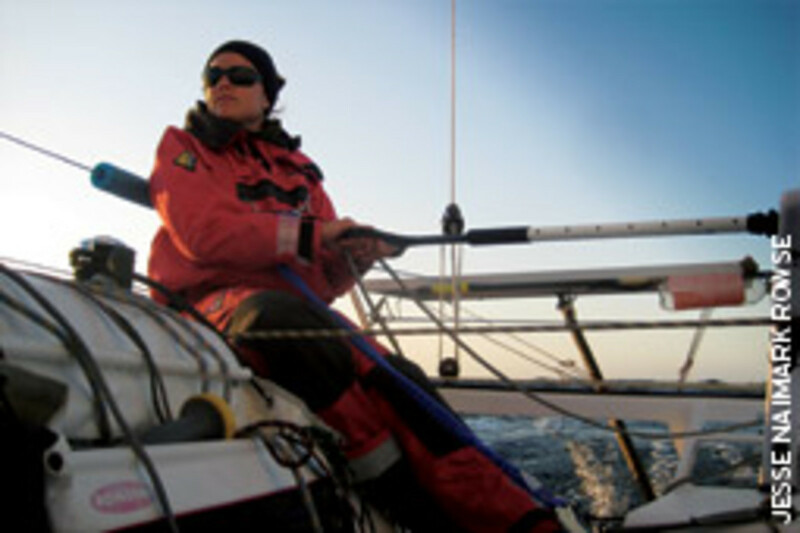 Early in 2011 she packed up and moved to Lorient, France, to continue preparations and do the qualifying races. It was tough, tedious and devoid of glory: work on the boat till late, pasta for dinner, maybe a movie, then hit the sack to do it all again the next day. But there was a good side, too. Without hired help she couldn’t delegate, so she became a woman of all trades, learning about carbon fiber repair, synthetic rope splicing, weather forecasting, electronics maintenance and living in a cabin the size of a linen closet. “I’m only 5 foot 1, but I’m almost at an advantage because half the battle is staying comfortable,” she says. Yes, guys might have more muscle, but they’re taller, too, and don’t easily fit on tiny boats. 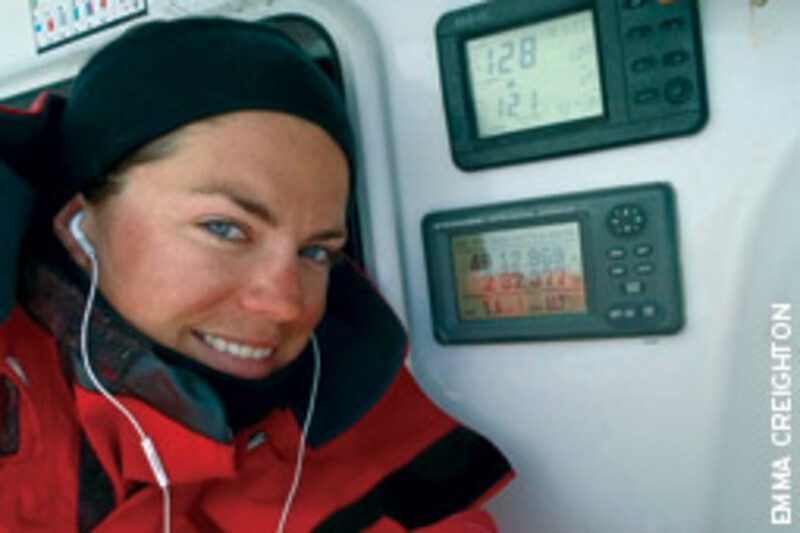 “It’s an ocean race that takes a month, so what if a sail change takes a minute longer because I have to use a winch?” She says she can always make up time by sailing smarter, but there’s not much one can do about discomfort. Emma and her older sister Jessica were home-schooled, or “un-schooled” as Lown puts it. The goal was to let the girls develop independence and passion. They also learned to deal with their parents’ divorce. 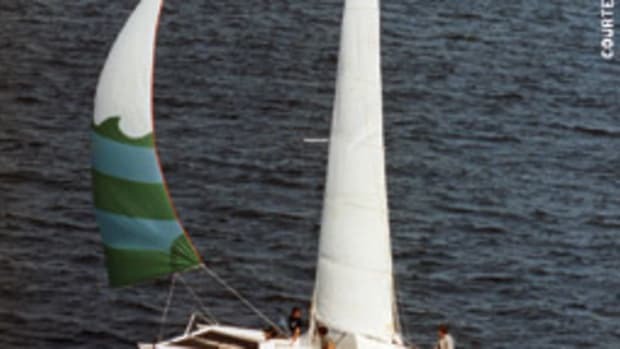 Later, Emma attended the private Putney School in Vermont before enrolling at Tufts University in Massachusetts, where she joined the sailing program. She also went against the grain by picking Arabic and Middle Eastern studies as her major. “She was always interested in philosophy and religion and the clash of ideologies,” says her father, Bill. Of course, Arabic isn’t widely spoken in New England, so she took a break from college for a job in Jordan as a diving instructor at a Red Sea resort before attending classes at the University of Jordan in Amman. To apply her language skills and support a worthy cause, she later worked as a counselor at the Seeds of Peace camp with Palestinian, Israeli and Egyptian girls, and others from regions of conflict. “I’d been living in Antigua and felt pretty strongly that I needed to do something intellectually challenging again, and something with a greater social meaning than just hanging around on the beach and going fishing,” she says. Despite her petite physique, Emma stands out because of her spirit and because she matured during the Mini Transat. The wind was capricious, she was “almost run over by a [insert expletive] tanker,” and she had to deal with gear issues. She also stopped in the middle of the ocean to stand by a competitor whose boat was damaged after a collision with a ship, for which she received redress. It’ll be fascinating to watch Emma’s career develop as she continues to build her ocean racing résumé, maybe with a Class 40 campaign next. Whatever she does, I sure hope she will also continue to be Emma: courageously honest and refreshingly unscripted.